Put 1 ½ sticks of softened butter and 1 ½ cups of sugar in a bowl and thoroughly beat with an electric mixer. Add 2 eggs as you run the mixer at medium speed. 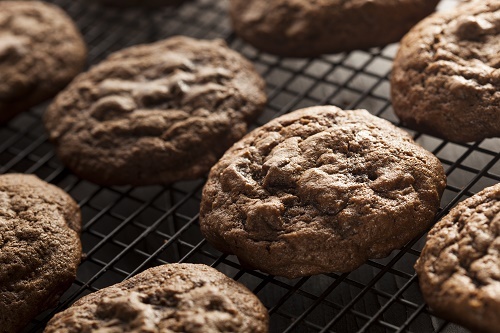 Fold in 1 ½ cups of all-purpose flour, ¾ cup of unsweetened cocoa powder, baking soda and a pinch of salt. After the mixture blends thoroughly, add in a cup of toasted pecans and 3 ounces of chocolate chips. Bake at 375°F for 12 minutes.